New team skills are the skills that employees need in the new knowledge-based economy. This isn’t anything new, nor is it a surprise. So, You’re the Lone UX Resource on the Project… Now What? UX practitioners in small teams or projects face unique challenges, so industry-standard solutions for large organizations aren’t always a good fit. Often those solutions are too large scale, costly, scary, and overwhelming for a small project’s management team, and they may be skeptical about the return on investment (ROI) making that level of change would bring. 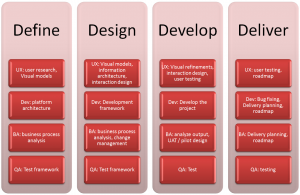 There are entire user groups and businesses devoted to how to best fit UX into an Agile project. A number of models are emerging that discuss how UX fits and how sprints need to be structured in order to get the best out of UX.